Even as advanced as we have become in how to keep water and food preparation more sanitary, there are common mistakes that are made every day that lead to food poisoning related sickness. The worst part about food poisoning is that so much of it can be prevented. We make common mistakes every day that can cause bacteria to form in our bodies that could lead to some very uncomfortable and potentially dangerous illnesses. Over 30 million cases of food borne illness each year is a very sobering number, but if you take the time to practice some healthy habits in the kitchen and in restaurants, you can minimize your chances of exposure to these bacteria. Keep dishes and kitchen area dry: Bacteria thrives in warm moist areas so leaving dishes overnight to soak in water is never a good idea. This makes it twice as difficult to remove all of the dangers by washing alone. Keep dishes washed regularly and if leaving overnight, rinse all food off and do not leave to soak in water. Make sure all areas of the kitchen are clean and dry as well. 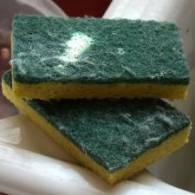 Sponges carry all kinds of bacteria and many people mistakenly will use and re-use a sponge for dishes and for wiping countertops without properly cleaning them. Throw the sponge in the dishwasher or steam it in the microwave for about a minute. Wash your hands before eating or preparing food: Much of the bacteria that ends up in food gets there because of human contamination. Whether it is eating before really washing your hands or eating food that was prepared by someone who didn’t make sure their hands were clean, this ranks up at the top of causes for food poisoning. Cut and prepare meat and vegetable products separately: If you use the same cutting board and utensils, any bacteria that is in the meat, especially uncooked poultry, it will spread to the other food being touched. Emeril Lagassi, well known chef, often jokingly says about chicken and poultry to “wash everything… wash the car it came in!”, and he’s not far off. Never use the same utensils directly after cutting and handling meat products. Don’t thaw food on the counter: I know a lot of people say that this was done for years with no ill effects, but that is not quite true. More often than not, these food borne illnesses can pass us right by and we chalk it up to a slight ‘flu’ bug or just not feeling right. It is known now that thawing food in this way will increase the bacteria growth and make the food itself a breeding ground. Most microwaves have a ‘defrost’ option which can be used–just be careful that it is watched so the food doesn’t start to cook. Thawing in the refrigerator overnight or in cold water (changed every half hour) is fine as well. Avoid undercooking food: This is especially true of pork, poultry or fish, but is also a concern with red meat. It has often been said that red meat is safe at any temperature as long as the person is not at risk. That is not altogether true, as the E.Coli bacteria can be on meat even when it has passed inspection. Poultry should be cooked to an internal temperature. Pork products should be cooked to at least an internal temperature of 145 degrees Fahrenheit while most other meat should be at 165 degrees. Preparation instructions for sashimi or raw fish for sushi dishes must be strictly adhered to such as freshness, cleanliness and proper handling. Don’t eat raw dough: Raw cookie dough has often been a temptation as we are making a batch of cookies–however the raw egg in the mixture is a breeding ground for many bacteria that can make you sick. Best to avoid the raw stuff and opt for ice creams and treats that mimic the ‘raw cookie dough’ flavor. Refrigerate uneaten food within an hour: It has been believed that allowing food to cool before putting it in the refrigerator is the better way, but this is actually incorrect. Once the food is prepared, the bacteria begin to multiply the longer it sits. It is recommended that food be refrigerated within and hour or two after it has been cooked. Another thing to remember when storing meat that includes bones–be sure and remove the meat from the bones and keep them separate if not throwing the bones away. Don’t re-use raw marinades: Food that is marinated overnight needs to have the marinade itself either disposed of immediately or if used again, brought to a boil first. Waste not, want not is a good practice,but there are some things that are just plain unhealthy to keep using. Wash all fruits and vegetables: Although most foodborne illnesses come from meat or poultry products, fruits and vegetables are certainly not immune. Much of this food is stored in the same area and the bacteria can end up on the produce as well. Make sure all fruits and vegetables are carefully washed clean with water and patted dry with a paper towel. These are just some tips to keep you and your family safe from all of the different types of food borne illness that exist. Eating should be a pleasurable experience, not something that has you running to the bathroom every ten minutes. Pay closer attention to the way food is handled, stored, and prepared and be aware of how easily these bacteria and bugs are spread. Eating is a big part of staying healthy so it is important that what we are putting into our bodies is as free of all these things as possible. 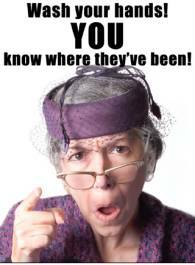 Don’t let careless mistakes take your family down–be aware and be safe! Researching for that one was an eye opener, let me tell you. And that’s just in the kitchen.. check those restaurants and grocery stores too! One thing I forgot to add was that rotisserie chickens in stores that are hot on purchase..beware. The longer they sit out in the heat, the more the bacteria is multiplying. Unless they come fresh of the rotisserie, you might be inviting a bug in that will make you wish food had never been invented. Very interesting and helpful information. It really makes you just want to eat at home! Thanks for taking the time to provide this.